In these times of austerity, there’s not much that can make you feel as virtuous as using an entire chicken, bones and all, to feed your household for two nights. There’s something about making stock that makes me feel, well, a bit smug. I entertain the illusion that I’m a proper domestic goddess who never wastes a scrap of food and makes everything from scratch. And it definitely cancels out the minus domestic goddess points I got last Sunday for ordering a pizza because I was too hungover to leave the sofa. Noodle soup shops and stands are ubiquitous in Bangkok and for good reason – that stuff is seriously addictive. Even without a sprinkling of MSG there’s something in there that makes you guzzle the stuff down, destroying your clothes with splashes of stock, and then ask for another bowl. Or is that just me? 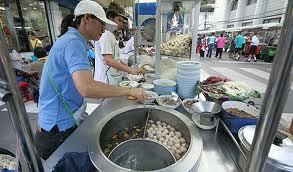 I have stood and stared at many a soup vendor to see how it’s done and it’s really amazing. The chicken is cooked whole in the stock. The remaining ingredients are put into a small sieve-like cup and plunged into the stock to cook and soak up the stocky goodness. And all this at lightening speed to feed the hungry lunchtime crowds. What can I say, it’s a dish that makes me happy to my core and I can’t think of a better way to start the week. Never have leftovers tasted so good! Bones and carcass of one chicken. Place the chicken carcass and bones into a medium-sized saucepan and cover with water so it comes to about an inch above the chicken. Add all of the stock ingredients and bring to the boil. Reduce temperature and simmer for at least an hour, preferably two. If you are making the stock the night before or well in advance, allow to cool, drain and refrigerate. If you don’t have meat left over from the roast, season your pieces of chicken generously with salt and pepper and place in a baking dish and put in the oven and cook for 25 minutes. Sprinkle the peanuts onto a baking dish. Bake for 5 minutes, shaking half way through. Remove from the oven, allow to cool, chop coarsely and set aside to use as a garnish at the end. Re-heat the broth and bring to the boil. Add the soy sauce, fish sauce, lime, sugar, salt, pepper and reduce to simmer. Once the chicken has been in the oven for 25 minutes remove it and put it into the broth to finish cooking. Allow the chicken to cook in the broth for ten minutes. If you are using already cooked left-over meat, put it into the stock to re-heat for five minutes. Bring a pan of water to the boil and cook the noodles according to packet instructions. Drain and divide into the bowls you will use to serve. Remove the chicken and place onto a plate or chopping board. Remove the meat from the bone and cut into small pieces. Return the stock to the boil. Plunge the pak choy, bean sprouts and spring onions into the stock and stir. After only a minute remove the vegetables using a slotted spoon and place on top of the cooked noodles. Divide your chicken over the noodles too. Then spoon over the stock until the noodles are mostly covered. Garnish with the roasted peanuts and coriander leaves. Serve with chopsticks and a soup spoon.